Vista lighting offers an extensive variety of light fixtures perfect for mature landscaping. As well as, simple lighting techniques for concrete, deck, and down lighting for all your outdoor buildings. Copper, painted cast aluminum and plastic fixtures provide customers with diverse pricing options. Compared to previous models, the LED lights available today allow for bigger and brighter lighting. 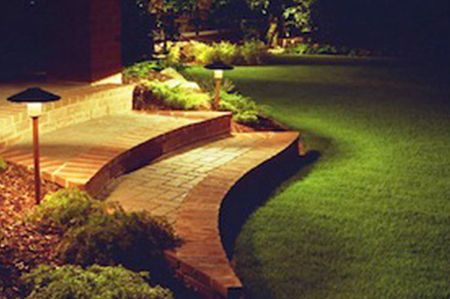 Customers enjoy adding outdoor lighting around their properties to enhance and enjoy their landscaping at night. We can expand on existing lights or install a new custom design with ease. Lighting transformers can be synced to an irrigation system controller for timing and even to your smart phone. For those customers who want top of the line lighting technology, we offer FX Luminaire. Simply sync your phone and your dimming and changing colors with FX. By installing FX Luminaire landscape lighting, you can easily change the colour scheme to suit any function or holiday, without stringing temporary lights throughout your property.